Round #50,000 was fired today at 1:15pm (1:15:32 according to the camera, specifically). The winner of the guessing game contest is: lindertw. His guess — today at 12:35 — was off by just 40 minutes. Congratulations! The photograph capturing the event, and the identity of the shooter, will be revealed in next week’s HK45 update. Hmmm, from the photograph I’m guessing the celebrity shooter wasn’t Wayne Weber? Its not just his hands, although if you take a class w/ someone you should be watching his hands on the gun and not what most people do, which is watch where his bullets go. I’ve known him for a while too, so maybe an advantage. But its not just the hands, its the background. I could be wrong, but it looks like pine forest in the Fayetteville, NC, area. I was at Fort Bragg for 10 years, so that’s familiar. Plus if you watch his TV show much of it is filmed in NC. The background looks very much like some of the areas seen in the TV show. 2+2= Larry Vickers. I knew it’s Vickers! Now Todd, do you have any plans of continuing the test, or we should expect another pistol? What if it is Ken Hackathorn using a prototype set of Vickers Tactical Hands? Na, that”s crazy or is it??? is that a sasquatch between the 2 trees on the left side of the photograph? …because if it is a sasquatch it’s awesome! What and when is the next pistol test? Todd aftet 50 thousand rounds of 45 the hk45 is still usesable? dj — Absolutely. There is no question that I could continue to carry the HK45 and rely on it 100%. Look for the test wrap-up to be posted tomorrow with lots of details. what about P30 test? Or that test (to reach 100 000 shots) was discontinued? MB — Legit question. The P30 test is over. We (both HK and pistol-training.com) looked over the gun and came to the conclusion that further testing didn’t make sense. A major component broke, the gun still fired over 5,000 rounds before it had problems. But the gun no longer runs reliably enough for me to carry it, and so we decided to stop the test. todd- can you please elaborate on the hieine sights and why you prefer them over other ususuall suspects such as the trijcons ,etc? also, re; the p30 ,of which i have 2 v3s, , how did you detrmine which size grips would work better? ozy — The Heinies have a much better front blade:rear notch ratio, allowing for faster shots, all else being equal. I’m also a fan of the dot-over-dot “Straight Eight” tritium lamp setup. The only way to figure out which grip configuration is best is to try them at the range during live fire practice. First, you want to choose grips that allow you to operate the pistol properly without riding any of the controls or preventing you from reaching any of the controls. Next, focus on what gives you the best control over the gun from shot to shot. I’d choose comfort as the leas important factor. The benefit of having 27 different grip options is to give you the best shooting capability. Todd— thank you for the elaborate response. i really like the ergonomics of the p30, and being a left – handed(but in his right mind…. )shooter, also the very accomodating ambi controls. my main ‘beef’ with this great gun ,is the awefull da trigger, the long travel, and reset. what’s one to do? any viable solutions? any other left- handed oriented handguns you’d recommend to try out? ozy — The LEM version eliminates the need to deal with the DA trigger. Historically, DA triggers on HK pistols have been hit or miss… some come from the factory beautiful and others are frankly poor. LEMs tend to be far more consistent and are extremely shootable. The Smith M&P is also 100% ambidextrous in its control. Todd– thank you very much again for your insight. when it comes to laser(red/green) units, on the P30 and/or the hk45,which have you found to be more reliable and best to operate with ? 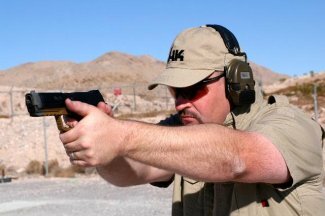 …and Todd– just a quick feedback on your grip selection process– have just done that in the range, shooting with different combination of grips ,and felt,(and the results were quit obvious as well)the a small-small- small yielded the most control over the pistol, with less recoil felt and much more muzzle contorl. I don’t yet own one, but after a bit of research I really like the Viridian laser/flashlight combo. jeff– thanks a lot! i’ll defenitley look into the veridian. If you pick one up I’d love to hear what you think. I want the Sig Sauer P226 9mm. endurance test!!!!!!!!!!!!!!!!!!!!!!!!!!!!!!!!!PLEASE!!!!!!!!!!! !